The eighth Power Pack mini-series since the team's return from hiatus (and the sixth featuring the artwork of Gurihiru), Day One looks back on the squad's origins, and their first adventure. When the Power family unwittingly wandered into the path of a serpentine alien force, they were quickly scattered and disoriented. While Mom and Dad were taken captive aboard the alien mothership, the four kids ran into a noble sorcerer, who granted them each incredible abilities with his dying breath. Fred Van Lente is the second writer to handle the Pack since their rebirth in 2005, but his familiarity with their personalities is evident right from the start. It's easy to lose sight of a young character's age when (s)he starts dealing with globe-threatening intergalactic warfare, but Van Lente never allows the plot to progress too far without reminding us that these are just kids. They're constantly throwing jabs at each other, bickering like a real family, and never really speak beyond their age. While Alex, the eldest of the troupe and de facto leader, always seems to be putting on an unusually brave face for a twelve year old, his body language often betrays his uncertainty. These may be very bold, mature kids, but at the end of the day they are still children. Van Lente does get a little carried away in a few spots, which gives the issue a borderline Saturday morning cartoon vibe, and will probably turn away much of the older audience as a result. The younger audience this line is targeted towards should love it, though. It's cheery and exciting without talking down to them, maintaining its dignity despite the presence of a walking, talking stallion with a magic wand. I've read a few stories where this writer has mailed it in, but I can't say that about his work on Power Pack: Day One. He's given us a tight cast, a firm plot and some interesting food for thought. While the issue certainly has its excesses and shortcomings, overall it's a solid package. 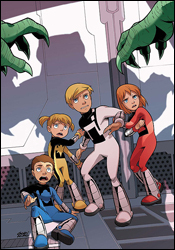 The artistic duo at Gurihiru Studios, in charge of pencils, inks and colors, has given the Power Pack a distinct visual punch for most of their comeback, treating the squad to a smooth, cartoony appearance. Gurihiru's efforts are simple and colorful enough to keep the attention of the youth, but stylized and handsome enough to catch the eye of more serious readers. The artistic team has become closely tied to the Pack's identity, and I don't know if I'd enjoy their adventures under anyone else's watch. Having said that, this isn't the studio's best offering. I was much more impressed with their contributions to the preceding Power Pack and Fantastic Four series. Their work feels less refined than before, a bit more hurried and humdrum. Their take on the kids themselves is still very good, a credit to their close association with the majority of the team's recent books, but their surroundings and the aliens they're interacting with aren't really all that imaginative. This wasn't my cup of tea, but to be fair it was never intended to be. Unlike the preceding Power Pack minis, I felt kind of silly reading much of this issue... in the past, it was childish but still entertaining to adults. Day One is almost exclusively for kids, overflowing with rainbows, talking, smiling, walking animals and glitzy superpowers. Fred Van Lente's writing is technically quite good, but his imagination has taken the Power Pack to a place that I'd rather leave unexplored, and Gurihiru's contributions aren't up to their usual standards. Just flip through this if you aren't seven years old or really, really want to know what's going on with a discarded old team from the '80s.